Senior journalist Dilrukshi Handunetti who until recently served as senior assistant editor of Tiran Alles’ Ceylon Today newspaper has resigned in protest of the company’s editorial policies and censorship Colombo Telegraph can now reveal. Ms Handunetti who was overlooked recently by the management for the editorship of the newspaper has complained that censorship had become severe at the Ceylon Today in recent times. During her absence from the country Handunetti’s junior Jayantha Nissanka who was the paper deputy editor was appointed Editor of Ceylon Today after Hana Ibrahim the previous editor was ‘kicked upstairs’ as Editor in Chief and no longer controls the newspaper editorial policy. Interestingly Ms Handunetti was instrumental in writing a editorial accusing former Ceylon Today Editor in Chief Lalith Alahakone of fabricating stories about his sacking by Alles in a two page article that attempted to destroy the credibility of at least five other reporters who also left the paper in protest of Alahakone’s treatment. Despite Ibrahim announcing to the Ceylon Today editorial that the Alles Management had let Alahakone go four days later her own editorial claimed that the senior editor had in fact not been sacked. Handunetti was re recruited by Chairman Alles after Lalith Alahakone’s sacking after Ibrahim convinced the politician and businessman that Handunetti had been unable to work for the senior editor since he was discriminating against her. Together with Ibrahim as Colombo Telegraph has extensively written Handunetti spearheaded the campaign to prevent media activist groups from reacting or condemning Alahakone’s treatment by Alles two years ago a clear case of hindering a chief editor’s editorial independence. 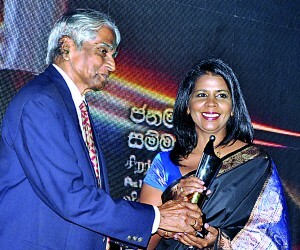 Handunetti was awarded Journalist of the Year at the Editors Guild awards for her reporting in Ceylon Today last year. wrong with the present day Lankan, as one sees standards collapsing in almost all walks of life. Is this as a result of the pressures of consumerism and very need to survive in today’s uncertain society. The Senior journalist Dilrukshi Handunetti of Ceylon Today resigns in protest of the company’s editorial policies and censorship. You write as you were born yesterday! Every enterprise has its own agenda and any employee who deviate from it is liable to be removed. This happens in any sector and is no secret. Colombo Telegraph also function under such guidelines. Are you trying to tell us that CT will never get rid of an Editor or any other employee who go against its agenda? Look at the headlines you have quoted above. Who benefits and who is subjected to a bad judgement with headline like that? Not CT for sure. Currently Nigeria is taking advice and using Sri Lanka’s method to eradicate Boko Haram terrorists. Did CT ever report on this? Reporting such news is not in the agenda of CT. This happens everywhere and in all countries including the US, UK and the other so called western democracies. Why do you think Tiran Alles invested so much money on his “Ceylon Today”? Isn’t that to promote his agenda? Will you be surprised if one of these days Dilrukshi Handunetti becomes a regular contributor to CT?? For a beginning, why not consider the fact that freedom of expression cannot be viewed as the same as some Vadai franchise, where the trademark holder can order his vadai-cart fellows exactly what they are supposed to shout out as they go down the street? You, another yesterday’s born! Try not to respond to my posts because you expose your ignorance. “Freedom of expression” is an individual right. On your own you can express what ever you want. But if you write for a newspaper and paid to do so you have to abide by what the publisher requires. If not, you leave (or get kicked out) and express your freedom somewhere else. Are you retard not to see the parallel of this scenario to your stupid Vadai story? Actually, I am wasting my time by responding to people like you. Why the hell are you wasting your time reading her comments and then responding to her? Give me one reason. You must a mad, mad mad Yako indeed. Thanks for talking to P.yako on my behalf. In spite of your name you appear to know how to treat a lady. ‘standards collapsing in almost all walks of life’. I am surprised that there are still standards left for collapsing. ‘threat of full fledged authoritarianism.’ The threats are all gone. Sri Lanka is already a fully fledged authoritarian government. However through bribary, lying and skullduggery even in the international arena Rajapaksa has been able to maintain the myth that Sri Lanka is still a democratic country. A few days ago the Prime Minister of Australia Tony Abbott stated that Sri Lanka was one of the most peaceful democracies. This was to justify the transfer of 40 or so would be Tamil refugees from a Australian customs vessel to a Sri Lankan Navy ship – in the high seas (this Sri Lankan navy ship arrived in Sri Lanka two days ago and the refugees were handed over to the CID). The second Sri Lankan Tamil refugee boat carrying 150 or so men women and children are still held even as I write – in a customs boat in the high seas. Still there are many Sri Lankans with Ethic and dignity like Dilrukshi Handunetti and the UNP MP from Kalutara who resigned from parliament. So the Shills need to be exposed. Dog eats dog. Woman eats woman. Ho.ha.ho,ha. All for the sake of power and greed. And remember, hell hath no fury than that of a bitter woman. “Journalist of the Year at the Editors Guild awards”, the “Ingratien Award for Best Writer” What a bloody mess; Seems the judges need to get their heads examined. Owned by a sycophant, run by sycophants and then fired by the same sycophants….what do they say about getting fleas and lying with dogs?? Hana was a former Treasurer of the FMM. Will somebody there investigate the finance dealing of that FMM? If get landed in Lanka even the Gold will change as mere charcoal. DILRUKSHI HADUNETTI, TODAYS JOURNALISM IS A BUSINESS. WHERE EVER YOU GO U GOT TO FOLLOW THE RULES OF YOUR PAYMASTER’S APPOINTEES BE IT SRI LANKA OR THE WEST. I DON’T SEE NEUTRALISM IN JOURNALISM. ITS ALWAYS WITH A HIDDEN AGENDA. HAVE YOU SCRUTINISED PILLAY’S TEAM FOR SRI LANKA? Gone are the days dear honesty prevailed. Today its either revenge or to get even. Each news media has an agenda. its all about money……………..
Like George Soros funded NGO lackeys..
01st world cover up their sins at the expense of the developping world. The world does not know where Sri Lanka is on the map but yet we have become the whipping boys. People does not know where Sri lanka is but sure have heard the name. Honesty is being exchanged for laptops, cheap loans, …. and personal security from white van ride to the point of no return. To think of that it was these wretched buggers that were fighting for Human Rights and Freedom of the Press then. See how the Alleses and the Rajapaksas have patched up once again after the first bear hug, paying the LTTE to help elect MR as President and the subsequent fall out. These buggers have everything in life except shame and self respect. YOU MEAN SHE RESIGNED IN PROTEST AT THE VERY THING THAT SHE DEFENDED????? If she dint quit she should have been fired for the. She has nothing to support this poster campaign. Dilrukshi has beenb sleeping too long with the wrong mate. She is one capable writer who needed Tiran’s dough, but thank god, she walked out. Tiran is the tyrant who has not only destroyed media but also the country. Dont forget, he and Sripathi by their own admission are the ones who robbed the victory of Ranil wickramasinge by giving PRABHARAN 100 million in cash. Wonder what old man Alles would be thinking in his grave? Can he call Tiran his son? or Is he? I am yet to read a single piece written by Hanna Ibrahim. It’s a known fact that even her editorials are written by the likes of Hadunhetti and other contributors to the paper..Isn’t it curious that a supposed editor of a national newspaper has a zero web presence on anything written in the past? Yet she survives.. Such is the serious lack of talent or competence needed to be an editor in Sri Lanka. All you need is to be ready to do any dirty deal for the publisher..look at the Ceylon today..with supposedly a activist muslim editor one of its lead stories is about extremist sinhala organiseations revealing the “truth” about Aluthgama. people like Hana Ibrahim, Nisthar cassim etc are not journalists who just report what they say. They ,like the MR admiration union, like to have a career and maybe make money.Even a free computer or a petrol allowance given will be taken without caring about who gave it. These are the morals of the new rich semi literates now running the country. But these terrible times demand fearless journalist of a different breed. Journalist who cannot be bought, intelligent, broad-minded and impartial. Can we say such things about these two ? 1. He says they should be of a different breed. 2. Cannot be bought – Well, that is a tall order. does one check? By making a pass?